I had a complaint on this golf cart prior to the application of Battery Equaliser. Dale and Glenn Cassidy, local representatives for Battery Equaliser had contacted me about the product and this was a perfect time to do the test. They checked all the batteries for specific gravity and voltage prior to installing product. As they stated to me the product will not help batteries with bad cells. Voltage levels had to be within .5 volts of each cell. Specific gravity could not be below 1150 checked with a Hydrometer. Due to the amount of sulfation that was in the batteries, which were five years old at the time of the test — December 1994 date on the batteries — this set of batteries did take more water to refill for the first month. In tha same time frame from March through the middle of May we have replaced two sets of batteries in other carts which had the same vintage batteries. Specific gravity and voltage levels have stayed the same as when Battery Equaliser was first installed. Our Company is looking at the positive results that Battery Equaliser has had in Cart 112 for further usage in the remainder of our fleet of Golf Carts. Golf Cart 112 was a 36 volt system with six-six volt batteries. Cost of test for 35 ounces of Battery Equaliser was approximately sixty dollars plus sales tax. 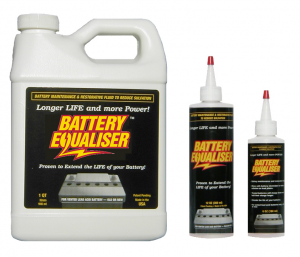 Battery Equaliser is available in 4 different sizes for most applications: 6oz, 12oz, 32oz and 128oz bottles. Please use which ever is greater for maximum benefit.